Since the end of last year we’ve expanded our in-house administrative dashboard for GEO|ADS by including a real-time spatial visualisation component for the greater Athens metropolitan area. This map displays the administrative divisions of Athens (i.e. Kallikratis) and overlays important information about GEO|ADS, including local ads that are currently running (for which you can get more information by hovering your mouse on them) and colour-coding the municipalities based on the last 50K impressions. This part of the dashboard is extremely impressive as it provides an immediate indication of where our AthensBook and ThessBook apps are being used, where users engage with our ads and how we can maximise value for our customers. Much of the data we currently use in-house will soon be available to our paying GEO|ADS customers along with a slew of statistics about their campaigns in a web portal available in the coming months. Obviously creating our SVG based spatial analytics dashboard meant a wholly different approach, as the goal was very different to the one solved by KML files: We now cared more about the accessibility of aggregate information at a glance than the provision of detailed, extensive high-resolution spatial analytics. To create the spatial analytics component we made use of a number of tools and libraries. First, there’s the data. Our existing KML-based reports employ a high-resolution grid overlay over Athens that provides a very engaging view regarding the use of the applications and how (or rather where) users engage with them. You can visualise impressions, clicks, CTRs and even conversions and generate heatmaps on the fly. We have even experimented with network-enabled KML generation, whereby Google Earth accesses a dynamically generated KML on the server every few seconds and updates the overlay dynamically (extremely cool, but not worth the resource and latency overheads). While impressive, the dependence on Google Earth is cumbersome to some people unfamiliar with the application. Then there’s the need for a more ‘traditional’ presentation of the data, along established administrative lines and the need to ‘print’ the reports. To solve this we decided to go with the (new) Kallikratis’s administrative divisions (municipalities). This way it would be easier for customers to ‘see’ how popular they were in Chalandri vs the centre of Athens, instead of trying to ‘decipher’ the high-resolution grid (Some people are not that hot about geography, but obviously we will keep providing our KML high-res grid version as well, for those keen on more detailed spatial analytics). To create the municipalities map, we got the administrative polygons from geodata.gov.gr. The information provided by geodata.gov.gr was needlessly complex for our purposes. This meant that SVG visualisation, let alone dynamic visualisation, was out of the question in a web context. To remedy this we simplified the provided shapefile by using the free, online flash-based tool MapShaper. This made interactive, yet high quality (viz. ‘printable’) SVG visualisation a realistic proposition. The next step was converting our ‘simplified’ shapefile to a Web-friendly GIS format; that was no other than GeoJSON. After converting the simplified shapefile to GeoJSON, we were left with a .geojson file measuring a mere 257KB; and that included all of Attiki, including information like the municipalities’ names etc. All this was on the ‘client-facing’ component. Actually counting impressions per municipality was the most interesting part of this endeavour: determining which municipality a ‘point’ belongs to is akin to throwing a dart on a world map and figuring out which country it fell on. Easy enough for a human, not so much for a computer. To process the stream of ‘impression’ data (that comes from our server infrastructure, which is not covered in this post), we used Python, a pretty popular language (both internally at Cosmical and in the not-totally-braindead-GIS crowd) and a combination of OGR, Shapely and Rtree. In our initial version we used only OGR and Shapely, effectively calling point.within(geom) for every single one of the 50K points in our data set and every single one of the municipalities (encoded as features in our simplified shapefile and converted to Shapely features). This was further optimised with an Rtree index. By creating an index of the municipalities of Athens, effectively storing their ‘bounding boxes’, determining the municipality that a point belongs to became a much more efficient process: using the index, one or more (usually between one and four) candidate municipalities were returned. Shapely was then asked to find in which one of the (one to four) municipalities the point belongs to. Once it found it it proceeded to the next point. The R-tree optimisation cut the time it takes to process the 50K impressions down by a staggering 80%! 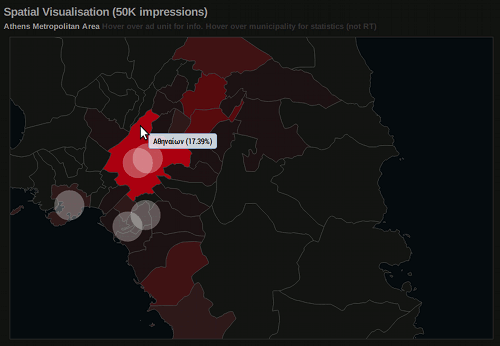 The result of all this is a near-realtime visualisation of the number of ad impressions in different regions of Athens, colour coded appropriately and additional, interactive overlays of information about running ads, statistics etc. with minimal use of imperative constructs and a data-driven design that is both extensible and extremely efficient.